"Bullet is a Muttchi. 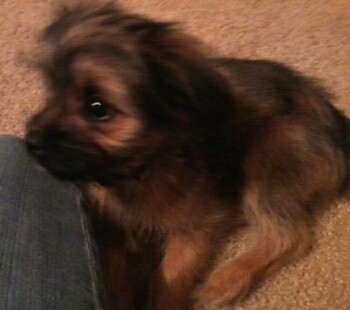 His father is a Chihuahua and his mother is 100% mutt! 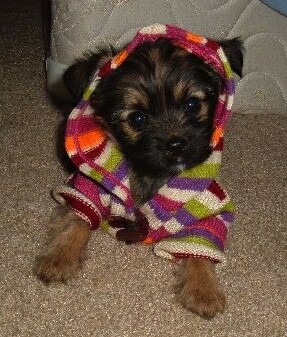 However, we think he may have at least some Cairn Terrier in him. He's very playful, learns quickly and totally enjoys his other canine pack friends Lizzy, our 5 year old Borgi and Tucker our 4 year old Doxi-Pekapoo. 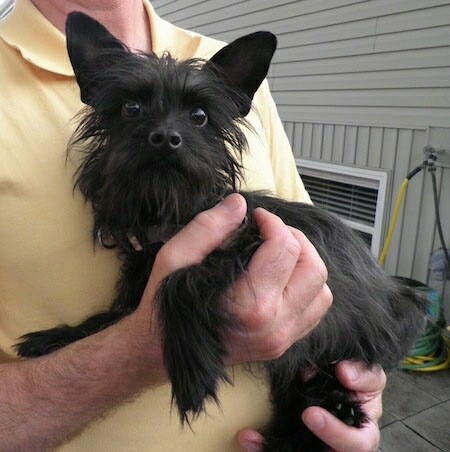 He looks a little like Toto the Cairn Terrier in the Wizard of Oz, only much smaller. We used Cesar Milan's method to introduce Bullet to our other dogs. That is, before the dogs were introduced to each other, my husband took the older dogs on a leash walk in one direction, I took Bullet on a leash in the other direction. We met up and just continued to walk. By the time we got home, there was no 'posturing'... just your average sniffing each other. We've had Bullet for 5 days and all three dogs get along quite well. As for house breaking, he's doing very well. No accidents in the house however we do take him out very frequently. Hopefully he'll eventually give us some sign that he wants to go out. 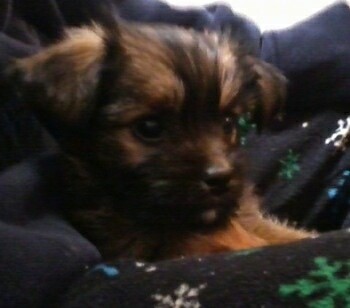 Having this little 6 pounder is a joy. 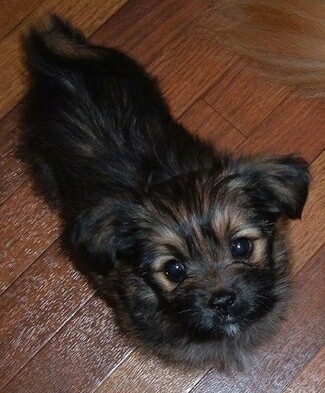 He sorta completes our little pack of mixed breeds." 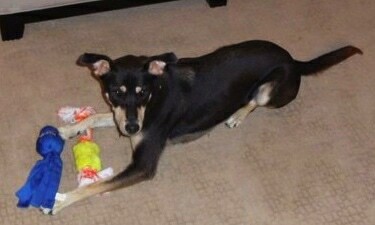 Karma's owners were curious as to what was in her mix. They decided to get a canine DNA test done to find out for sure. Below are the results. Check out Karma's unique multi-colored nose painted on so perfectly. 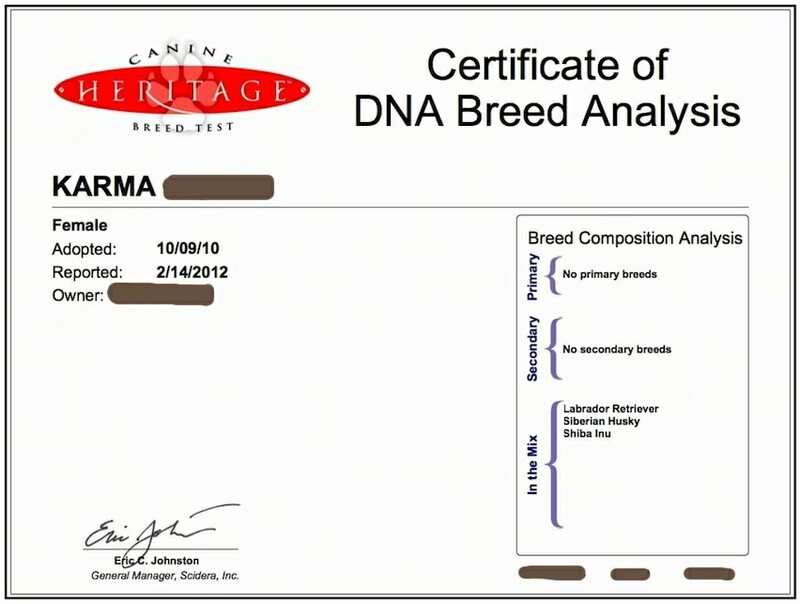 Canine Heritage test results for Karma. No primary breeds, no secondary breeds. In the mix: Labrador Retriever, Siberian Husky and Shiba Inu. 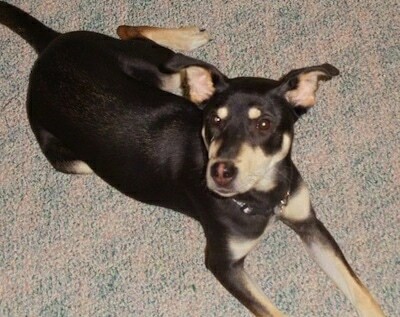 Karma the Labrador Retriever, Siberian Husky and Shiba Inu mix. 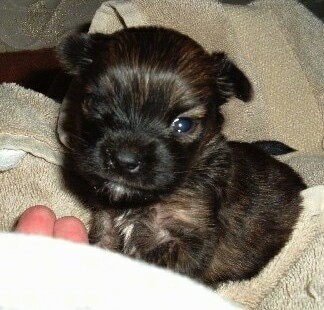 Pippin as a 3 week-old-puppy—she is 37-74% Miniature Pinscher, 10-19% Shih Tzu, and 10-19% Lhasa Apso. 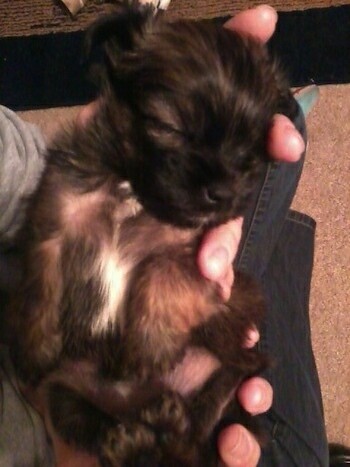 Pippin as a 4-week-old puppy—she is 37-74% Miniature Pinscher, 10-19% Shih Tzu and 10-19% Lhasa Apso. 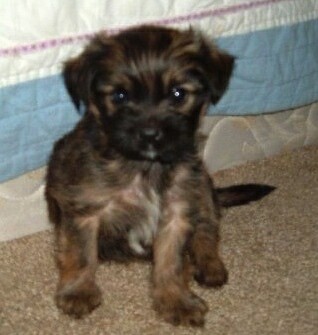 Pippin as a 6-week-old puppy—she is 37-74% Miniature Pinscher, 10-19% Shih Tzu and 10-19% Lhasa Apso. 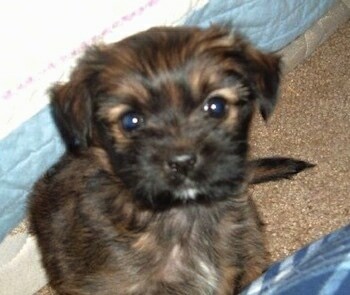 Pippin as a 8-week-old puppy—she is 37-74% Miniature Pinscher, 10-19% Shih Tzu and 10-19% Lhasa Apso. 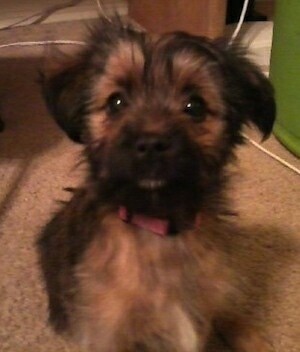 Pippin as a 9-week-old puppy—she is 37-74% Miniature Pinscher, 10-19% Shih Tzu and 10-19% Lhasa Apso. 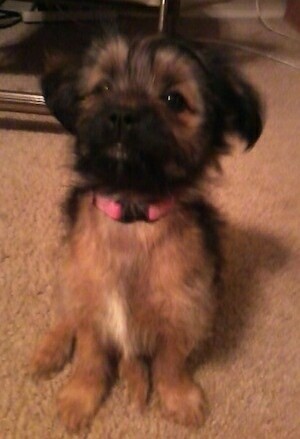 Pippin as a 12-week-old puppy—she is 37-74% Miniature Pinscher, 10-19% Shih Tzu and 10-19% Lhasa Apso.